Over sixty percent of the American population is overweight or obese. For those included in this statistic, the Paleo Diet and Paleo Diet Food List may be the solution to their weight problem. This diet is rapidly growing in popularity around the globe and has proven successful for many individuals. You can watch the “Paleo Diet Food List” video presentation I prepared or keep reading below. Foods allowed on the Paleo Diet include those similar to the ones our ancestors ate many years ago before processed and junk foods became available. With the Paleo Diet, the theory is that, if our ancestors did not eat a certain food, we shouldn’t be eating it either! Well, if you're at 12% body fat and you want to go to 8% body fat, you may realize that it does take quite a bit of work AND the right strategy! The Paleo Diet is that STRATEGY. Now, this isn’t a hard sell or anything like that. In fact, you can get or believe whatever you want, but what I do know is that this strategy got me MASSIVE results. The Paleo Diet got me more results in a shorter time than any other strategy. So below, I'm providing you with a basic list of foods that are on the Paleo Food List. You may find this list of foods beneficial in your quest to drop those excess pounds and become healthy and energized. Lean meats such as beef with any visible fat being trimmed. Flank and top sirloin steak. Extremely lean hamburger with a fat content of no more than seven percent. Lean veal and other cuts that are lean. Lean pork such as chops and loins with all visible fat trimmed off. White meat of lean poultry with skin removed. Chicken, turkey and game hen breasts. (Best if enriched with Omega 3). Any cuts of rabbit or goat meat. Liver from chicken, pork, lamb or beef. Tongue from lamb, pork or beef. Marrow from pork, beef or lamb. Sweetbreads from beef, pork or lamb. Meat from wild game such as bear, alligator, elk, goose, pheasant, quail, rattlesnake and more. Various fish such as cod, eel, bass, bluefish, haddock, herring, mackerel, halibut, perch, red snapper, salmon, shark, sunfish, tilapia, trout, tuna, walleye and others. Shellfish such as abalone, crab, clams, lobster, mussels, oysters, scallops, shrimp and others. Many different fruits such as apples, bananas, blackberries, blueberries, cantaloupe, cherries, cranberries, figs, grapefruit, grapes, honeydew melons, kiwis, lemons, limes, mangos, oranges, passion fruits, peaches, pears, pineapples, raspberries, rhubarb, strawberries, tangerines, watermelons and all other fruits. Many vegetables such as artichoke, asparagus, beets, bell peppers, broccoli, Brussels sprouts, cabbage, carrots, cauliflower, celery, cucumber, eggplant, green onions, kale, lettuce, mushrooms, mustard greens, onions, peppers of all varieties, pumpkin, radishes, seaweed, spinach, squash of all varieties, tomatoes, turnip greens and more. Certain nuts and seeds such as almonds, Brazilian nuts, cashews, hazelnuts, macadamia, pecans, pistachios, pumpkin seeds, sesame seeds, sunflower seeds and walnuts. Wine should be limited to eight ounces per day. Beer should be limited to twelve ounces per day. Any spirits should be limited to four ounces per day. Only two ounces of dried fruits should be eaten per day when desired. A mixture of nuts with fresh or dried fruits can be eaten. Only four ounces of nuts and two ounces of dried fruit should be consumed. Any processed food containing dairy products. Dairy products such as butter, cream, cheese, spreads, frozen yogurts, ice creams, milk low in fat, non-fat dairy creamer, powdered milk, skim and whole milk and yogurts. Cereal grains such as barley, corn, millet, oats, rice, rye, sorghum, wheat and wild rice. This includes bread, muffins, rolls, crackers, cake, waffles, pastas, pizza and any other food containing wheat or its products. Legumes or beans such as black, fava, horse, kidney, lima, navy, pinto, white and string beans. Black eyed peas, chickpeas, snow peas, sugar snap peas, soybeans and soybean products such as tofu, lentils and peas are also to be eliminated. Peanut butter and peanuts are to be avoided. Avoid vegetables that are starchy such as sweet potatoes and yams, starchy tubers and manioc. Eliminate potatoes and products such as chips and fries and tapioca pudding. Foods containing salt such as salad dressings, condiments such as ketchup, bacon, cheese, meats from the deli, hotdogs, ham, frankfurters, olives, pork rinds, pickled foods, processed meats, salami, salted nuts and spices, sausages, fish and meat that has been smoked, dried and salted. Stay away from canned fish and meats unless unsalted. These should still be soaked and drained before eating. Fatty meats such as bacon, ribs, poultry skins and many others. Avoid sugary sweets, soft drinks and fruit juices. Basically, you may already see and get a sense now of the shift that may need to happen in the minds of most people, if they are to adopt a healthier way of eating and living, and the Paleo diet. The Paleo Diet sits on the foundation of re-educating ourselves about what is good and not – about what is healthy and not healthy. Education and awareness here is the key. Understand the Paleo food list and you'll be well on your way to creating greater health and energy in your body! 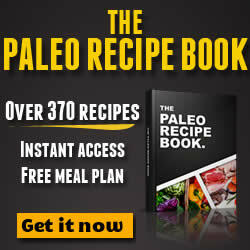 I also wrote another post related to this topic, if you would like a more concise version of the Paleo Diet Guidelines.